Today we’re off to The Burren, a limestone plateau that an officer of Oliver Cromwell’s army described in 1650 as “a savage land, yielding neither water enough to drown a man, nor a tree to hang him, nor soil enough to bury him“. First we stop for lunch and a fascinating lecture on the role of the Irish (and Irish Americans) in the preservation of folk music/ballads. Cool stone building, too! in bloom. One of the interesting aspects of the Burren is its modern use as pasture land. Are you nuts, you say? Pasturing on karst? Did you see the pictures above?? According to the comments by that officer in Cromwell’s army, “… and yet their cattle are very fat; for the grass growing in turfs of earth … that lie between the rocks … is very sweet and nourishing.” While most of Ireland is too cold for grass to grow in winter, cattle can graze in the Burren ’til spring. So the ancient tradition that dates back to Neolithic times is still in use today, and cattle are herded here from all over Ireland for winter grazing. In addition to producing fat cows, winter grazing is also good for the Burren ecology – it prevents regrowth of scrub and woodland, thus minimizing disturbance to the Burren’s rich flora. But the Burren is much more than just plants! There are more than 90 megalithic tombs (large stone above-ground burial chambers) and a number of stone ring forts that were constructed here more than 5,000 years ago in the Neolithic late stone age. The sites may have had functions in addition to burials; they were constructed at a time that corresponds with the establishment of the first farming communities, and thus may have played a part in territorial and community identity. We are visiting the Poulnabrone portal tomb, one of the finest and most visited. It consists of 2 tall portal stones flanking the entrance to a rectangular stone-lined chamber, 2 slightly smaller supporting stones, and a single large capstone. 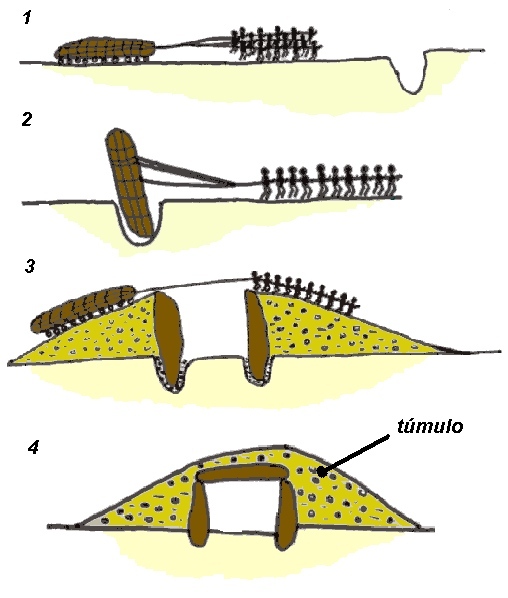 Often a mound of loose stone (cairn) and earth would have surrounded the tomb on 3 sides, stabilizing the chamber, with the space below the capstone forming an entrance; I found a possible scenario for creating these types of tombs as shown to the left. However, for the Poulnabrone, the cairn was originally no higher than it is today, creating the dramatic tomb structure you see now. Obviously it was built well, since it stands here after 5 millennia (pretty cool! ), but how it was built is not known. Excavation of the Poulnabrone revealed at least 33 individuals were buried in the chamber – infants, children and adults, both male and female, over a period of perhaps 500 years. Likely the bones, highly fragmented, were initially buried or allowed to decompose elsewhere before being transferred to the tomb around 3800 BC. Personal possessions buried with the dead included a polished stone axe, a decorated bone pendant, stone beads, quartz crystals, flint weapons, and fragments of pottery. A thousand years later (~1700 BC), a newborn baby was buried in the portico, just outside the entrance. The labor required to construct the tomb and its continued use over such a long period of time suggests that this portal tomb, with a dominating presence on the limestone landscape, served a powerful symbolic role – a territorial marker or a center for ceremony and ritual. We were very impressed! Time for some traditional Irish music, and Doolin is renowned for that ! As we return to Doolin we pass a much smaller portal tomb near the road, several tower houses (and castle? ), and a stormy sea. Ireland is certainly picturesque. 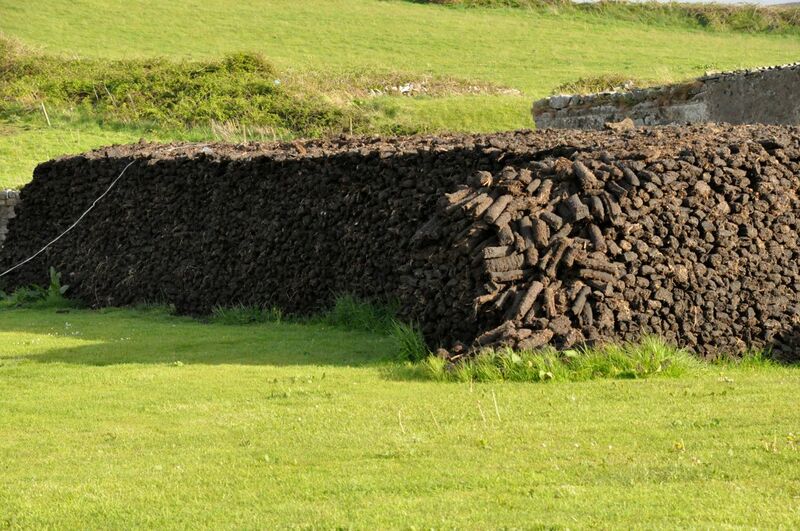 As we walk to our dinner/pub to hear Blackie O’Connell on the Irish pipes, we pass a big stack of peat logs, drying out. Pretty impressive! Although I don’t know how anything dries out in Ireland. same players (Blackie and Cyril), plus a ballad singer (Geraldine). Well, this is a small post, but enough for now. Tomorrow, our last day of the tour, we take a boat to the nearby Aran Island of Inisheer – where there is much to see. This entry was posted in Ireland, SW Ireland Tour.